Tenerife is the largest of the Canary Islands and is a great place to travel. British and German tourists come in their tens of thousands every year to visit its spectacular beaches and lively nightlife. It is also very popular among holidaymakers from the Spanish peninsula, especially during Easter time. Tenerife is probably one of the last European paradise isles. It offers lush forests, exotic fauna and flora, deserts, mountains, volcanoes, incredibly beautiful coastlines and spectacular beaches. Las Galletas A peaceful little fishing village. Los Abrigos A picturesque working fishing village on the South East coast of the Island. Costa Adeje Adeje is an old town on the hill above the coast. It is now a major tourist destination. Las Américas a major tourist town. Los Cristianos Once a small fishing village but now a major tourist destination. Puerto de la Cruz featuring Loro Parque Zoo. Los Gigantes tourists and locals. The impressive Los Gigantes Cliffs are located here. There are also many whale and dolphin excursions from here. La Laguna the World Heritage city. La Orotava Beautiful city in the north of the island. El Medáno Laid back, alternative haven, one of the windsurfing capitals of the world. It is usually very windy here. Santa Cruz de Tenerife the capital of the Island and department of Santa Cruz de Tenerife. Los Silos A small, traditional Canarian town between gorgeous mountain and the sea. Neighbouring islands are a few hours ferry ride away. La Gomera is the nearest. A poor, banana-growing region in past decades, Tenerife has been brought up to European living standards since the arrival of mass air travel in the 1960s, which brought industry and millions of tourists each year. Over the decades this has led to many complexes and houses being built, making parts of the island highly urbanized. While part of the EU for political purposes, the island remains outside its customs and VAT area, making high tax goods such as tobacco and alcohol cheaper than elsewhere in Europe. Many of the young tourists hang out on the south of the island with older and family tourists choosing Puerto de La Cruz and its environs. On the south side there is consistent summer, little to no wind, and pretty much perfect beach-weather for much of the year though there have been rare instances of cool to cold weather in the Jan-Feb period. Also expect some very wet days for that time of year though most days will still be sunny. There are plenty of hotels, activities and British food and drink. On the north side of the island you will find more green and vibrant local culture. There is a more Spanish year-round springtime feel. The weather fluctuates a bit more here, but is also mostly pleasant though not as hot as the south. In between the north and south of the island sits Spain's tallest peak, the barely dormant volcano El Teide (3718m above sea level). Tours previously allowed people into the crater, but tourists are no longer allowed into the crater for safety reasons. The local currency is the Euro and most places accept credit or debit cards, which require a chip and PIN. There are many exchange bureaus in the main tourist resorts but not in the Spanish places like Santa Cruz. The native language is Spanish. In the south English is spoken by everyone with German and Italian common too, but in the north English is spoken by fewer. No big problem should be anticipated regarding communication, though. In the local dialect a soft 'c' is pronounced as 's' rather than as 'th' on the Spanish mainland, so cinco (five) is 'sinko', not 'thinko'. At the Don Quijote  Spanish school in Tenerife you can take 4-6 hours of courses a day. All courses including beginner courses are taught entirely in Spanish. As an island the usual way to arrive is by air. There are two airports, Tenerife South (Reina Sofia) near Los Cristianos and Tenerife North (Los Rodeos) by La Laguna. There are several buses connecting the airport to the main cities; for smaller cities, expect to have to make bus changes. They stop around midnight and start again around 5-6AM. Trasmediterranea run a weekly ferry from Cadiz in Spain which takes two days. There are also ferries to the other Canary Islands, going to Gran Canaria from Santa Cruz de Tenerife (about €80 return) and La Gomera from Los Cristianos. A hire car is the best option for discovering the remote regions. There is a wide selection of companies, ranging from budget to premium. When choosing one of the cheapest companies (like Goldcar), make sure to understand the terms & conditions, since there may be hidden fees or tricks. Such as petrol refill fee at the time of return, or mandatory insurance to be paid at pickup. If you only own a debit card (not credit card), for example autoreisen allows rent without deposit - because the car is almost fully insured (and thus a bit more expensive). The car return is then as simple as dropping the keys at the office. TITSA buses cover most of the island and the buses are fairly frequent. A BONO travel card is a good idea if you intend to spend some time travelling on the buses as they can save 50-70% on journey costs. Only one card is needed by any number in a group and can be bought at bus stations as well as some tobacconists. Beware of the morning (~7-8) traffic jams on the highway in the direction of Santa Cruz! A tram line operates between Santa Cruz and La Laguna; the BONO card is valid there. You can also prebook an airport transfer with Tenerife Airport Transfers who possess a wide range of vehicles such as shuttle buses, minibus, limousines and coaches. The roads are in good shape, also the ones in the mountains - but esp. on roads carved into mountain there may be rocks fallen on the road. The highways around the island are free, but limited to 120 km/h. 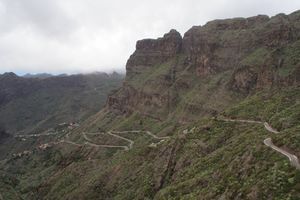 Regular roads range from normal to twisty and narrow roads in Anaga, or around Santiago del Teide. Tenerife is building many new roads including some major routes. While not very accurate in the past, as of 2013, TomTom maps now cover the majority of the island and have many points of interest. Garmin used to be not accurate as well, current status unknown. Openstreetmap project provides fairly complete maps of the islands roads, hiking trails and other points of interest. From the car park, tourists can take the 10 minute cable lift to 3550 m (27€ per person/return). Return ticket is valid for 1 hour, if you miss it you will have to pay additional 12.50€ to go back down (however this limitation does not seem to be enforced very strictly). To climb to the summit (the uppermost 168 m) special permission is essential by request to the National Park Office in Santa Cruz. From the top there is an amazing view all over the island. WARNING: At 3718 m (12,198 ft) El Teide is the highest mountain in Spain. The rapid ascent by cable car can lead to altitude sickness, in even the strongest climbers. If symptoms start to manifest you should descend immediately, note that at peak times the wait for the cable car descent can be over an hour. At the summit, strong winds are not uncommon which significantly reduces temperatures. Irrespective of temperatures on the beaches, a trip to Teide (or even just the National Park) can be very cold, with snow at the peak common until typically March/April on average. In winter expect a few feet of snow and ice, and strong winds so prepare accordingly. Details on what to expect can be found at Altitude sickness#How high is high. Fantastic place to go hiking. There are some routes that you can do. In Cruz del Carmen you can find the visitor's center where you can get information about the park. Don't forget go to the Pico del Inglés viewpoint where you can see a beautiful view of the island (if the weather is good). From La Laguna you only need fifteen minutes in car to arrive. Other places are Taganana, Roque las Bodegas, Almáciga (black sand beaches). There are some wonderful drives all around the island. There are long winding mountain roads with breathtaking scenery but they might be a challenging for less skilled drivers. Popular destination is Masca village located about 1 hour drive north of Los Gigantes (parking spaces are very limited). For those who do not rent/own a car in most resorts there are companies organizing coach trips there. One of the biggest lava cave systems in the world, accessible from Icod de los Vinos. Long trousers and good boots are required. More information on todotenerife.es. Teide Observatory, one of the best spots in the world to observe sky provides guided visits. Santa Cruz has a number of museums and an art gallery. Also a space museum and planetarium on a small scale near La Laguna. In February there is a huge fancy dress parade by locals which is said to be third in size after Rio and Notting Hill carnivals. Visit the beautiful old towns of La Orotava and San Cristóbal de La Laguna, the latter being a UNESCO World Heritage Site. Visit the world class botanical garden just above Puerto de la Cruz. Tenerife is a favoured destination for scuba divers, with numerous dive operations of all qualities and nationalities. The waters round the island are diveable throughout the year, with the temperature varying between 18 degrees in January to around 25-26 degrees in August. Go around the harbour wall in Puerto de la Cruz for fantastic volcanic rock formations, or feed the stringrays at Las Galletas for something a bit different. Water sports are available in the south including surfing, wind surfing, speed boat parascending and jet-ski. Nowhere seems to rent canoes. Of course, many visitors just want to spend their time on a beach or by the hotel swimming pool. Playa Americas beach is black volcanic sand, but Los Cristianos is yellow imported sand. The black sand feels the same as the yellow, but can be much hotter when sunny and is not as pleasing to look at to many. Beaches often have sun-loungers with parasols available to hire for the day, but if you are doing this for a few days it is probably better to just buy a parasol and some beach mats. Tenerife is an excellent destination for hiking. There are routes for anyone, from leisurely one hour strolls to extremely strenuous full day hikes in demanding terrain with either a huge ascent, descent or both. There are several books describing hiking routes, such as two Landscapes of Tenerife books from Sunflower Books, one covering the northern side and the other covering the southern side. It's a good idea to get a guide book before you go to Tenerife, as they might be difficult to find there. Another option is using openstreetmap/wikiloc as guide. 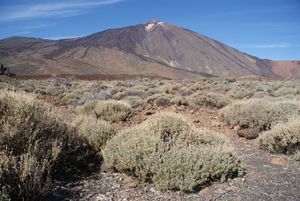 El Teide. Alongside the cablecar, a hike is possible as well. The ascent by foot starts at the base of the “Montaña Blanca”, at an altitude of 2200 m (very limited parking). Don't underestimate the short walk as the gradient and low oxygen levels make it challenging even for experienced walkers. After a relatively gentle start up a 4x4 track for around 4 km, you begin the steep and spectacular climb, ascending 530 m in just over 1.5 km, when you will reach the recently rebuilt Altavista Refuge (3270 m). This offers climbers a bed for a maximum of a night and kitchen facilities. After a further kilometer and 250 m ascent, the path joins another leading to La Fortaleza viewpoint, which follows the contour around El Teide to the cable lift. If required for descent, always check if the cable lift is operational before you set off, as it does not run in poor weather conditions and closes without warning. You should allow 6-8 hours for an ascent and descent on foot. Accessing top of the mountain requires a (free) permit (book early, it's often full months beforehand), unless you visit outside the regular hours (before or after the cablecar operates). Also the Altavista Refuge has limited space and requires a reservation. Pico Viejo - a moderately demanding hike (hiking boots recommended) is possible from El Teide. One reasonable itinerary is leaving car at "Boca Tauce" (interesection of TF-21 and TF-38), taking bus (line 342) from there to the cablecar, going up and then just descending via Pico Viejo, Narices del Teide and back to Boca Tauce. It takes around 5-6 hours from the top to bottom. Masca valley. Probably the most popular (and somewhat crowded, compared to other Tenerife treks) path. Starting at Masca valley, going down all the way to a beach, inbetween massive cliffs. Check [Los_Gigantes] for access info. Taking the hike uphill requires at least water supplies, in case of high temperatures. Barranco del Infierno (Hell's Ravine), close to Adeje popular with hikers, you need to book to go on the walk. There is little to see but vegetation on this walk and a tiny waterfall at its end. The most western point is Punta de Teno with excellent views. The road to that point was been damaged but is now passable again. On Saturdays, Sundays and bank holidays however, the road is not open to the public between 10 AM and 5 PM. Instead there is the new bus line 369 departing every hours from several stops in Buenavista del Norte at 1€ per ride. Even if you don't plan to hike, hanging out around the lighthouse is already worth it. Roque del Conde, one of the most prominent mountains on the south coast. A few hours hike from the nearby Arona village goes through a relatively big canyon of Barranco del Rey and at top provides good views to all sides (unless mist builds up). Chamorga - Roque Bormejo. A round trip starts at a picturesque village of Chamorga, goes through mountains, along the shore (grand views! ), a lighthouse Faro de Anaga, Roque Bormejo village and back up through a valley Camino de Roque Bormejo. A relaxing walk (almost flat road) to Cabezo del Tejo viewpoint, through a (often) misty forest. Roque de Taborno ("Matterhorn of Tenerife") - a few hours trek around a picturesque mountain. The path crosses a cliff for a few meters, beware if you are easily scared of hights. Tenerife attracts a large number of cyclists all year around. Whether mountain biking, roadbiking or riding an electric bike, Tenerife has plenty of beautiful roads and dirt tracks. If you want to avoid the hassle of bringing your own bike, you can rent bikes on the island, for example in Las Americas or El Médano. Cycling is hard to do casually - the coastal roads are busy and there is little room for bikes except often in the gutter. However if you like cycling up hills there are plenty of steep roads to climb as soon as you leave the coastline. For those less fit, one tour company offers a car trip to the top of El Teide with a cycle down, no pedaling required. The island is quickly becoming an important winter destination for cross-country and enduro mountain biking, as on average it enjoys sunny skies and warm temperatures when Europe's bike resorts are covered in mud and snow. Exploring the island on a mountain bike is a rewarding experience, thanks to the great diversity of terrain, vegetation and elevation. Little compares to a descent through lava fields and Canary pines to the beach in time to sip a beer at sunset. Guiding businesses will take you safely on Tenerife's best trails. Loro Parque Zoo is in just outside the northern city of Puerto de la Cruz, which is an animal protection foundation as well as a huge animal park. Jungle Park close to the area of Los Cristianos is well worth a visit, the bird of prey show is a must. There are free bus links to the park, but getting on one to get back is not much fun! Siam Park (opened in 2008) which is a water park in Costa Adeje created by the owners of Loro Parque, 2 metre high artificial waves, several cafes/bars. You'll also find the Aqualand water park in Costa Adeje. You will find many local shops selling excursions to these parks. Go-karts and motor bikes are raced in the main track and two sizes of cart on the kit track. Located close to Playa de las Américas free bus service from and back to your hotel. In Playa de las Américas, there are many shopping centres, such as the Safari Centre and the Siam Mall, which have many familiar clothes shops and restaurants. Santa Cruz has a big market by the station on Sunday mornings, and a local picturesque market Mercado Municipal Nuestra Señora de África (open daily until 14:30). Las Americas has one Thursday and Saturday and Los Cristianos on Sundays. There are weekly markets in Las Américas and Los Cristianos, as well as some other little villages. They sell a wide range of souvenirs, but beware of pickpockets as they like to take advantage of the crowded areas. On the highstreet in Santa Cruz, you can also find many big brands, sometimes at a slightly lower price than in the tourist areas. Fish is a large part of the local diet with restaurants that allow you to choose a fish from their selection (often hand caught) which they will cook for you. Black potatoes called papas arrugadas are served unpeeled and covered in rock salt, ready to be dipped into a local sauce. As in the rest of Spain, tapas are eaten a lot with local specialties including garlic sauces, refried beans and squid. Typical Spanish meals such as tortilla (potato omelette) and paella (rice dish with seafood) are common too. The south is full of plenty of junk food restaurants with hamburgers, pizza, chips, etc. There are 15 McDonald's including some on the beaches. Also note that in touristic hotspots such as Playa de las Americas, menus are available in numerous languages ranging from English, German, Russian and some Scandinavian languages, making it very easy to choose even if you are not familiar with the local dishes' names or don't understand Spanish. Lots of Chinese Restaurants are also available in Tenerife. You can eat as much as you can (buffet) paying fixed price like 6€ or 6.50€, let's say the price is different according to the variety of food. In the tourist spots, there are also many up-market restaurants, such as the Thai Botanico and Bianco's in Playa de las Américas. However, for those who want a taste of the culture, there are also lots of traditional Canarian restaurants, like Mesón Era las Mozas (which some people call the "courtyard") in Valle San Lorenzo (about 15€ in a taxi from Los Cristianos) and El Cordero in Guargacho (similar price). They both do a variety of meats cooked on the barbecue, sometimes doing quite large portions. Tenerife also has a reputation for the 'booze scene', with Playa de las Americas and Los Cristianos providing ample locations for those that enjoy 24 hour clubbing & drinking. The drinks available are the same as the rest of Europe (predominantly British) with prices being slightly less than those 'back home'. The local beer is the average tasting Dorada, available everywhere. More specialised drinks include banana liqueur. Barraquito, also called barraco, is a coffee specialty from the Canary Islands and particularly popular on Tenerife but also on La Palma. Ron Miel, in English is Honey Rum, is a rum made with Honey that is fantastic served over ice. In some more 'local' parts of the island it may be served as a 'thank you' for eating in a restaurant. Wine. There are a great variety of local wines. Malmsey (Malavasías), red wines, fruity wine. Tenerife is generally a safe place to visit but, as always, beware of pickpockets. Walking alone late at night is not advisable, as there are a sizeable number of illegal immigrants and local youths who have been known to take advantage of the lone late night reveller. Taxis are widely available, and not too badly priced though a taxi from the southern airport to Puerto Cruz is VERY expensive. The local police take a dim view of any form of trouble, and will arrest not just the culprits but anyone they suspect was involved. This will involve at least a 24-hour stay in the local jail and usually a fine, but it will not be a life-scarring experience. They will also arrest anyone who tries to sleep on a beach at night. Local law enforcement (police and Guardia Civil) are known to be very heavy-handed, and physical violence towards suspected troublemakers is common. Take note that when walking through Playas De Las Americas there are a lot of clubs and accompanying drunkenness in the night hours. There are no scorpions or snakes to worry about. Mosquitoes can bite at night, especially away from the coast, but they do not carry malaria. Do not take electrical items, credit cards or large amounts of cash to the beach if you plan to leave your goods unattended while swimming. The sun is extremely strong this close to the equator, so use plenty of high factor sun cream and do not sunbathe between midday and three o'clock (this is when the beaches are busiest anyway). Many, many shops on the island selling electrical and optical goods as well as cameras. You may think you are getting a bargain from these smooth talking salesmen but you aren't. You will overpay for something you could buy cheaper at home and even cheaper off eBay. Your goods may be faulty. Your guarantee will probably be worthless. Your video camera may be SECAM which means a B&W picture in the UK (PAL). These shops are everywhere in the tourist areas and so many people have been cheated by them for so many years. Also, beware of places that sell video games (mainly for the Nintendo Game Boy or DS) as they are usually bootlegs. If you are holidaying in Tenerife you are probably going to be approached by "scratchcard touts" whose main aim is to part you with several thousand pounds for worthless contracts for time-share apartments. This view is backed up by the UK's Office of Fair Trading (OFT) who suggest that every year 400,000 UK consumers fall victim to these scams in destinations such as Tenerife, the Costa del Sol and Gran Canaria. On average each victim loses more than £3,000. These people usually seek for tourists on the road, by checking if your rental car has a sticker for a car rental company on them, before asking if you're English, then taking you to their timeshare club if you say you are. Another tactic is standing out on the road in popular villa-based areas, stopping passers-by. In both circumstances, a polite "No thank you" or walking away simply stops them bothering you. Waiting outside boating docks where popular tourist boat rides settle is occasional. Bogus "scratchcard touts" offer cards that will always be a winner, but to collect their prize, people need to attend a lengthy presentation and are persuaded into signing a contract for an "exclusive" club on the basis of false claims as to the price, range and quality of holidays available. The OFT's is advising people to ask three simple questions: can you take away the contract to consider at your leisure? Is everything you were promised in the presentation in the contract? Do you know exactly what you are getting for your money? If the answer to any of these questions is no, then simply walk away. The other main irritant on Tenerife are the Lookey Lookey men who try to sell you sunglasses, watches, jewellery and other cheap knick-knacks known as Lucky Luckies. They are quite harmless and generally don´t mean to cause trouble, they are just trying to make a living, but a firm NO generally works!! Some car rental companies like Goldcar charges extra money in Airport from your credit card. Always ask them how much they'll refund after you drop the car back. Read carefully about rental policy. There're a lot of reviews about latter on the Internet. Losing of vigilance may make big dark spot in your holiday. Tenerife is the island of eternal spring and the weather is beautiful all year round. Generally speaking, the weather is sunnier in the south and rather cloudy in the north. A typical Canarian climatic phenomenon is "calima", a strong wind carrying sand and dust from the African Sahara. Calima can cause allergies and respiratory problems so it is recommended to monitor the weather and especially the wind direction. The sea water temperature is usually between 66 and 77 degrees Fahrenheit, making swimming pleasant! For people who want to climb the Teide peak or plan to spend the night there, it is strongly recommended to pack warm clothes, as it is often less than 50 degrees Fahrenheit at the top. Gran Canaria is only 2.5 hours away by ferry. This page was last edited on 14 July 2018, at 09:49.